It's summer which means it's time to head to the beach and what better way to promote your business than with a fun Logo Branded Beach Ball. An in-expensive and fun way to get great brand exposure, play around with the kids on the beach and watch your corporate details fly through the air. 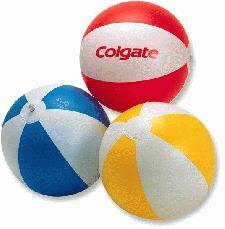 Run around on the beach and have hours of endless fun on your summer holidays with this promotional beach item. This product lends itself perfectly to brightly coloured logos to reflect the sun and the warmth of the summer breeze. For more brightly coloured, fun Promotional Summer Products, take a look at our full range! For more information or enquiries on our Logo Branded Beach Balls, fill in the form and we will get straight back to you.